What are 3D printing experts expecting for 2019? 3D Printing Industry asked 40 CEO’s and other leaders in the additive manufacturing sector to give their opinions. The 3D printing forecasts and expectations for the coming year demonstrate an increasing focus on moving AM to production. To achieve this goal the experts we surveyed note that efforts regarding workflow, repeatability, standardization, and automation are all underway. The leaders surveyed below were, in the main, optimistic about the coming year. Although uncertainty in the wider business environment due to political factors has the potential to cause disruption, or delay decision making. Make sure you subscribe to our free 3D printing newsletter if you want to keep up with what promises to be an eventful year. 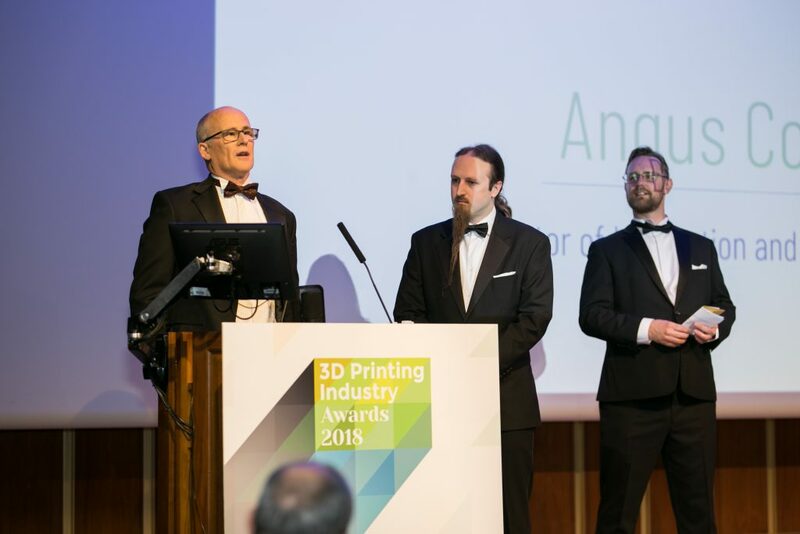 And don’t forget to nominate in the 2019 3D Printing Industry Awards. What are your predictions and hopes for the 3D printing/AM industry in 2019? With Brexit becoming more and more likely and an uncertain performance of the global economy, 2019 remains very hard to predict. The coming year will be make-or-break for many start-ups but also bigger players in AM. Overall, we are still optimistic that the industry will keep growing successfully. AM Ventures sees promising developments for a further increase of large-scale applications and ongoing industrialization of AM technology. Application-specific machines, special materials, automation of AM and new post-processing technologies will be hot topics in the coming year. 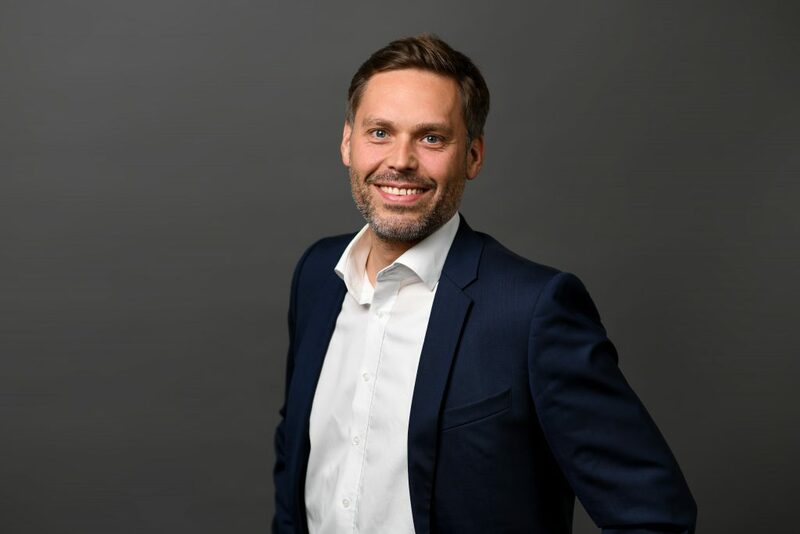 Arno Held of AM Ventures. I believe 2019 will mark a turning point in the industrial use of 3D printing as the year of the Additive Manufacturing Digital Factory. The coming year will see many more manufacturers embracing platform-centric 3D printing solutions for production applications. Optimized manufacturing methods are going digital to produce final parts with complete runs numbering in the hundreds of thousands or millions. With the latest innovations coming together in integrated solutions, the 3D printing industry will help companies innovate, design, and manufacture in new ways thus improving agility, reducing complexity, and lowering overall total cost of operation. Ultimately, we will see the power of 3D printing to transform manufacturing and thus businesses enabling them to realize competitive advantage. To date for metal 3D printing, the industry has seen increased for adoption for production applications in advanced manufacturing segments; especially medical devices, aerospace, and power generation. Even with this growth, there is still a great deal of opportunity for more organizations to embrace the transformational power of additive manufacturing, and I think we’ll see an uptick in adoption in 2019. I also believe we’ll see improvements in the technology and materials to support these applications. There is already a good deal of work in terms of process control and quality assurance, as well as an increased number of materials to meet unique needs in the market. The coming year will showcase the fruits of those efforts through optimized workflows. In the coming year, I believe we’ll see key advancements for plastic 3D printing with regards to materials and post-processing. I believe the biggest change we are going to see is delivering thermoset materials that behave closer to thermoplastics. We’ll have tough materials that are not brittle, handle high temperature, and produce durable parts that have a long life. The key next step will be to move polymers beyond prototyping into more production-type applications. With new materials and enhanced properties, what is achievable is absolutely game-changing. Post processing is another key development area for the entire 3D printing industry, particularly as we industrialize additive manufacturing. Support removal, curing, washing – these are all important areas to develop. As an industry, we ultimately need to be concerned about enabling our customers to create parts; therefore, we must think about the entire value chain. We talk about the power of additive manufacturing to lower total cost of operation (TCO). TCO includes the entire value chain which entails labor and post processing. And the more we can automate this process, the better it is for our customers. Making production real with the 3D Systems figure 4. Photo by Michael Petch. As we look to the new year, I believe we’ll see a broader adoption of additive manufacturing in dental laboratories and clinics. The early adopters will demonstrate the capabilities and transformational benefits of these solutions – paving the way for the majority. I believe that by continuing to introduce more efficient and effective digital technologies to the dental profession, we can shift perspectives and experiences so both practitioners and patients get greater satisfaction from delivering and receiving treatment. The ultimate goal is to improve oral care, and I believe 2019 will see the 3D printing industry make tremendous strides in helping dental professionals achieve that goal. We have observed additive manufacturing ecosystem has taken good shape over the last 3 years. We hope to see further evolution of this ecosystem with solution providers looking at various aspects of the technology and the supply chain. For example, there is tremendous thrust today on developing solutions for ensuring tracability of powder batches. In addition, distortion compensation analysis, MES for additive manufacturing, development of high performance powders, and AI based solutions to predict optimum process parameters for a given powder-machine combination are being focused upon immensely. We believe we will hear a lot more on these fronts in 2019. Another exciting aspect is the development of production lines for additive manufacturing. Several solution providers are developing systems that seamlessly tie the various steps involved in additive manufacturing such as powder characterization, printing, post processing and heat treatment. Such systems are aimed at achieving industrial grade productivity and quality control. We feel this segment will see tremendous growth in the years to come as more and more OEMs adopt additive manufacturing. I’m really excited by the role that generative design can play in expanding applications and making development more accessible to professionals in adjacent fields. 3D printing has reached a point in its development where professional printers and materials are accessible in terms of price, user experience, and reliability. That said, many professionals who could get value from 3D printing don’t have the computer-aided design skills needed to bring their own designs to life. My hope is that between generative design and accessible cloud-driven CAD packages we’ll see more people design and print their ideas. Every day we’re surprised and delighted by the user stories that come across our desks at Formlabs, and we’re looking forward to seeing what our community will build in 2019. I think it is prudent to take stock of the impressive and continued year on year growth of this industry and to consider if such growth is sustainable or even it is set to increase further. Looking back at the annual industry size as reported by revenues from products and services one can see cyclic periods of 8-10 years growth followed by a brief dip and then business as usual with subsequent year on year growth. Since the inception of this industry there have been two such dips; one in the early noughties and another in 2009 – both dips were the consequence of wider, global economic forces. A key factor to provide comfort in this industry is the shear breadth of technologies provided and applications served; if the bubble bursts in one vertical there are many more applications ready to benefit from 3D Printing/Additive Manufacturing. It is therefore reasonable to assume that, unless the global economy takes an unexpected downturn, this impressive ~20% year on year growth of this industry will continue. Michael Seal, Business Development Manager for Advanced Manufacturing and 3D printheads, Xaar Plc. My personal hopes would be that we see a widening of the opportunities within the 3D and AM space through the increase in performance of materials and open commercial models for technology adoption. Venture Investment will continue to grow as more unique technology startups grow beyond minimum viable product, and M&A will continue with service provider and technology acquisitions as in past years. A stronger focus on software, connectivity, and rapid services will support additive end users and fuel growth in new markets. Large materials and chemicals companies will solidify strategic positions in 3D printable materials and processes, but will remain disconnected from the broader software design and manufacturing workflows. Prediction #1: Metal 3D printing will become dramatically more accessible. The past two years have seen much technological advancement in materials science, hardware and software focused on part quality, system cost and ease of use. 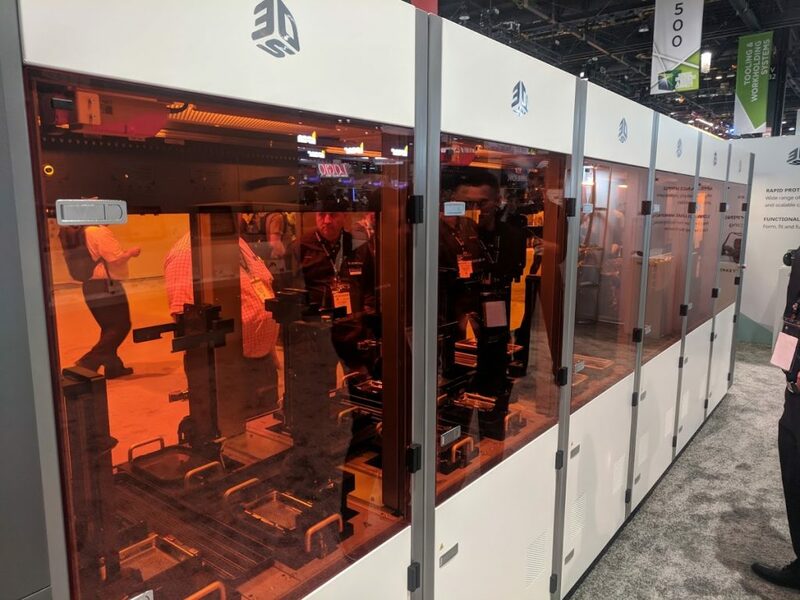 2019 will see delivery of hundreds of metal 3D printing systems at a sub-$200k price point. What we’re seeing with our early adopters is that while the vast majority have plastic printers, the Desktop Metal Studio System is the first metal printer they’re bringing into their facilities, citing the elimination of lasers and loose powders as a key driver of adoption. We believe that what we’re seeing in metal 3D printing is analogous to the PC revolution which brought computing to businesses large and small. As we wrap up 2018 shipping 10 complete Studio Systems per week, we are scaling up production to meet the rapidly growing demand. Judging from the first several hundred orders, it’s interesting to note that the demand for this technology spans across a broad swath of industries, and companies large and small. The printing press was arguably one of the most influential events in the second millennium, revolutionizing mass communication. In 2019, we will see a new class of metal printing systems that deliver on the promise of 3D — no tooling, complex geometry, assembly consolidation — while rivaling the productivity metrics of conventional mass production processes — e.g., casting, stamping, machining. 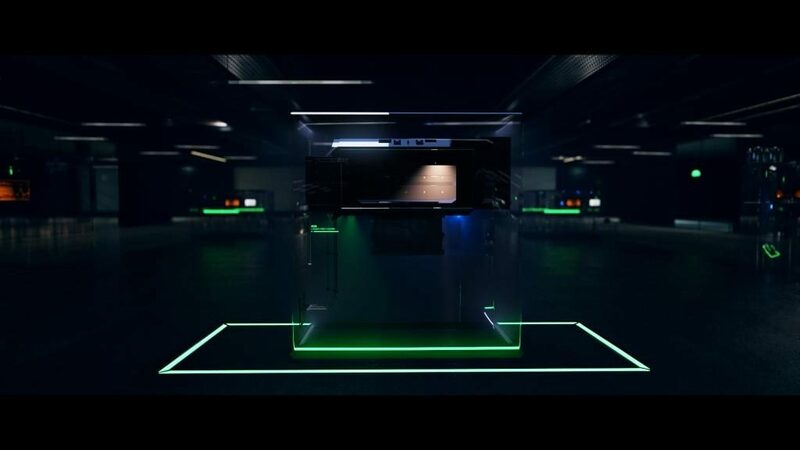 Orders of magnitude faster than today’s metal 3D printers, these “3D printing presses” will quickly transform the multi-trillion dollar manufacturing sector. We are excited what 2019 has in store, including the installation of the first Desktop Metal Production System – the world’s fastest metal printer – at a Fortune 500 company. And additional customer installations at major automotive, heavy duty and leading metal parts manufacturers will follow throughout 2019, with broad availability in 2020. We are at an inflection point with respect to adoption of generative design tools – software inspired by nature’s evolutionary approach to design. This is driven by both the maturity of the software tools, and the ability of metal 3D printing to create the complex geometry of the highly optimized designs. It must integrate seamlessly with existing CAD tools and workflows to simplify the process of defining input parameters, in order to optimize a pre-existing model or generate a new design from scratch. Users must be able to interact with the simulation environment and the design itself to see the impact of their modifications in real time. This enables more efficient design iteration and exploration. Desktop Metal’s entry in this field is Live Parts, a GPU-accelerated generative design tool that creates stronger, lighter part designs that leverage the geometric flexibility exclusive to 3D printing-all in a matter of minutes. Though these are the early days, we are already seeing hundreds of applications at world class companies across a broad range of sectors including automotive, consumer, aerospace and others. 2019 will bring ever more serial applications, even for end-use products. I hope that general standards will support the integration of the technology. The establishment of proven standards will accelerate adoption as more OEMs trust and invest in the technology. I predict that software supporting additive manufacturing will be given more weight in the process development to help create more holistic and integrated production solutions. 2019 is the year that metal 3D printing goes mainstream. In 2018, hundreds of companies started using the Markforged Metal X System, allowing them to print metal parts for a lower cost than ever before. As they validate the parts made on this affordable system, they will move towards producing end use metal parts at larger and larger scale with many types of metals. We hope that the active and vested engagement of material and chemical suppliers increases. These companies occupy an strategic position from which they can push and pull the industry to rates of technology adoption never seen before. We will also see mass customisation and more personalisation of consumer goods including shoes, chocolate and clothes with the option to 3D print at home. The 4D printing process will also continue to grow enabling the production of “smart’ objects that have the capacity to self-assemble or shape shift when exposed to different stimuli. More accessibility with Click & Print and other key solutions making it easier for non technical users to enjoy unique objects, more designers making money from their creations, a large toy brand will launch a desktop 3D printer . 2019 will see an increased convergence between design and manufacturing with focus on Design for Additive Manufacturing. Autodesk Generative Design will continue to focus on design exploration allowing users to consider options in manufacturing methods, materials, and business impact. We will see software enable a more holistic workflow solution from concept to print which will accelerate 3D printing adoption. We will see more production applications of additive manufacturing for both polymers and metals where additive manufacturing replaces more conventional manufacturing. We anticipate more hybrid manufacturing workflows where additive and subtractive processes are used to produce the final part. Aerospace, Medical, and Dental markets will continue to grow but consumer products, industrial machinery, automotive, and tooling applications will emerge as growth opportunities. In 2019 it will be critical for the aerospace, automotive and healthcare industries to make the most of 3D printing in order to compete. Additive manufacturing has already made its name across these industries, the key will now be to move from prototyping to pre-production and production ramp-up. 3D printing allows for iterative design, increased flexibility and the development of bespoke products and parts, which is particularly important for businesses operating in this space. For instance, with an ageing population globally, we anticipate 3D printing within healthcare to proliferate, as there’s an increase in demand for personalised healthcare and treatments, as well as customised 3D-printed medical devices. Rising protectionism and trade conflicts will have an impact on global supply chain to move toward decentralisation and regionalisation of manufacturing. Businesses that adopt smart technologies like AM to 3D-print parts and components are able to reduce production costs, processes, and time through part redesign and integration. This also makes manufacturing domestically more practical than importing from abroad. The industry is at tipping point, and 2019 presents an opportunity for manufacturers and businesses alike to embrace 3D printing across their entire manufacturing process. With the right combination of technology, skills and expertise, the UK has an opportunity to compete globally, and strengthen its claim as a manufacturing powerhouse. In serial AM production pricing, there is no longer a race to the bottom. The additive manufacturing industry will become more established and look increasingly like a traditional OEM ecosystem. Building long-term relationships between suppliers and manufacturers, standing purchasing agreements, and a focus on quality control processes will all become priorities. In 2019 we will see a big increase in the technical standards being set by companies like DIN and TüV in Europe, and ASTM, ANSI, UL and SAE in the U.S. These standards will increase the number of AM parts in real-world applications. We also expect a rapid development of data standards between controlling software and additive manufacturing machines. Many additional AM machine manufacturers opened up API access in 2018. Those data streams will need to be standardized to make monitoring efficient and to more quickly transfer data from ERP systems, order management software and the production floor. This will mirror the shifts we have already seen in the industrial implementation of CNC-milling equipment. In short, 2019 will be about standardization to enable the industrialization of AM for serial production. Surely this year will come full of innovations and exciting collaborations, reflecting the importance of 3D printing in the day to day of many companies. In parallel, without leaving it aside due to its great importance, manufacturers must continue working to understand the user in this phase of growth in additive manufacturing. It will be necessary to take care not only the hardware, but the entire ecosystem that accompanies it. In addition, the importance that vertical markets have been acquiring for months will involve an in-depth investigation with the aim of providing better specific solutions for the targeted sectors. In order to achieve these goals it would be mandatory to closely work with material manufacturers to implement all the new material developments into our solutions. In 2019, we’ll observe more intense focus on integrating software platforms with factory floors to realize the promise of Industry 4.0. As additive manufacturing continues to prove itself alongside more traditional production technologies, the promise of digital will garner heavier levels of corporate investment. With improved production reliability and more robust process and quality systems, the distribution of industrial applications will proliferate. We’ll also see expanded collaboration and consolidation across the additive manufacturing industry, especially if the financial markets turn. Large operators and IT platform providers will continue to partner in delivering agile manufacturing solutions to OEMs and consumers. A subset of service bureaus will represent targets for consolidation and acquisition from strategic buyers desiring pathways to address high-volume industrial needs as well as to provide the geographic reach necessary to achieve the supply-chain responsiveness demanded by connected consumers. We’ve observed corner-case applications in medical and dental that illustrate how additive manufacturing can compress supply-chains, and wring costs out of products while delivering better solutions for consumers. With cost curves converging with traditional production techniques, we are bullish on new business models and production paradigms that will continue to emerge around additive manufacturing in the year ahead. 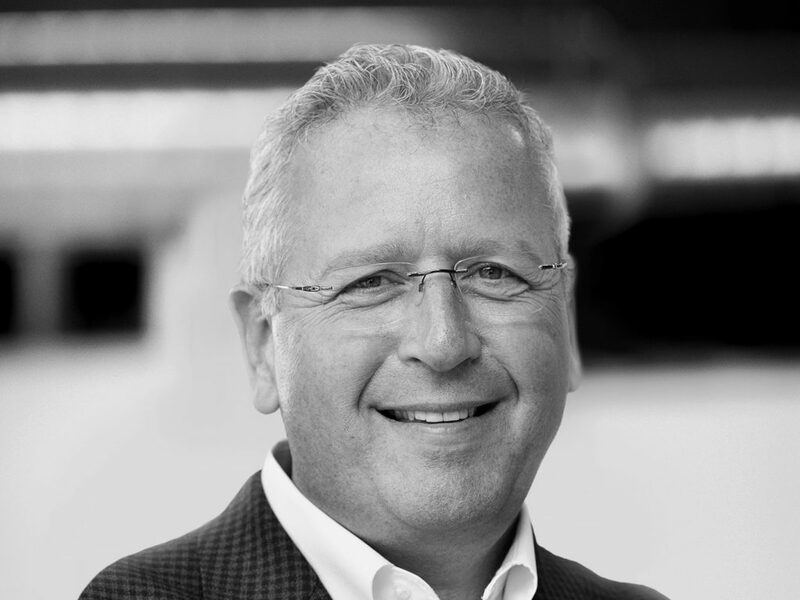 Rush LaSelle, Director, Digital Manufacturing, Jabil. Photo via Jabil. Customers tell us that to fully realize the advances and return on investment required by today’s market, they need solutions that fit their application, budget, and production workflow. The industry needs to rise to the challenge. In 2018, some new promising 3D printing technologies showed up and existing ones had been tuned to faster operations. There is an enormous movement in 3D printing right now. We note some first signs of a not yet mature, but definitely coming up disruptive technology maybe in 2019. Building on the momentum of 2018 investment and innovation, we anticipate end-use production applications to broaden beyond specialized industries like aerospace and medical. It will also be exciting to see the initial parts coming into the market from some of the most highly anticipated production-oriented product launches, specifically in metals. One trend we expect to hear more of in 2019 is digital thread. The efforts behind file formats, manufacturing software, and the benefits of encryption, security, and analytics of blockchain are quickly converging. Overall, we anticipate 2019 to be another year of high interest, energy, and growth for 3D Printing. It will be interesting to see how “pre-announcements” of products and technologies continue to disrupt the competitive landscape. HP’s MultiJet Fusion technology impacted the market long before they began to ship, a trend that HP seems to hope for again with the slow roll-out of their Metal Jet technology. Formnext saw a multitude of pre-announcements including the tease by EOS of its forthcoming polymer powder LaserPro Fusion technology. The good news is that this trend of one-upmanship was not just industry hype but actually resulted in real growth. Shipments for INDUSTRIAL class 3D Printers (those selling for $100K+) were up 22%in 2017 and are on pace to see 27%+ year on year shipment growth when 2018 is in the books as well. Forecast projections show the aggregate global 3D Printing industry on pace to rise above $8B+ in total revenues in 2019 and over $18B+ in the next 5 years with new technologies coming forward in 2019 needed to help make those forecasts a reality and further entrench the AM industry into the broader global $12T manufacturing market. In 2019 continued growth of the 3D printing industry as a whole can almost certainly be assumed. There are many opportunities ahead. At the cutting edge, continued funding for 3D printing research is leading to exciting new approaches coming from the likes of Lawrence Livermore National Labs, UTEP and Fraunhofer as well as companies both new and old. 2019 will see product introductions from several metal 3D printing companies as well as more industry adoption. It isn’t just the ongoing technological evolution of 3D printing that shows promise, production parts will continue to become more and more common in airframes as well as across the automotive and defense sectors. At Nano Dimension we expect this will grow to include additively manufactured electronics also. Additive manufacturing is on course to produce parts of greater strength, greater complexity, and greater functional value. With the ability to reduce part numbers, combine electrical and mechanical functionality and disrupt value-chains this is an industry that has already answered the ‘if?’ question. The current question should be ‘how much?’. How much of a final product can and should be 3D printed? It may be that uncertainty surrounding global trade tariffs is an unwelcome new business consideration, but it can be expected to add more fuel to the 3D printing fire with opportunities for more distributed manufacturing and supply-chain disintermediation becoming even more appealing. With this growth of industry adoption comes an accelerating need for qualification and standards, for both materials and processes. As more and more additive manufacturing materials and processes are approved for productions use the barriers to adoption will continue to fall. Higher throughputs and the growing involvement of larger companies, both as users and providers of the technology, bode well for additive in 2019. In summary, this is now a much wiser, more mature industry with more to offer than ever. The rubber/carbon/steel/conductive and dielectric materials are beginning to hit the road and 3D printing is showing signs of real traction. In 2019, we hope the industry will continue to collaborate closely to enable OEMs to build and scale their additive manufacturing capabilities enterprise wide. In the coming year, we’ll witness the increased adoption of standards in the industry. Stratasys already has major OEMs and Tier-one suppliers pushing specifications down into the supply chain. As this happens, the market is set to experience a dramatic increase of 3D printed, production parts. And it’s already happening in key industries like aerospace, where 3D printed and certified parts are flying on aircraft today. Materials, materials, materials…As new use cases for 3D printing emerge, so will the materials to support them in a refined and professional way. Whether it’s color, shore values, new composites, or bio-materials – innovation will drive this industry forward in 2019 and beyond. 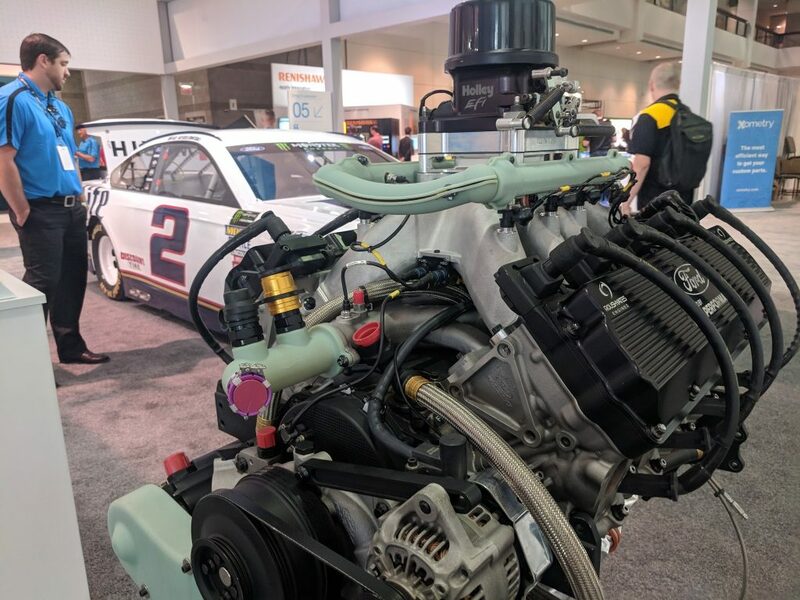 Team Penske car and 3D printed components on an engine with Stratasys. Photo by Michael Petch. Now that functional additive design has entered the zeitgeist, I expect more engineers will use the technology to increase produce performance and competitiveness. In addition to designing lightweight, stiff parts, engineers may want to design for compliance, vibration damping, CG and inertia, porosity, solubility, and other factors. Unfortunately, the CAD and additive vendors have done little to address the gaps between the CAD and part. For example, most CAD-integrated FEA and topology optimization uses static solvers on simple elements with isotropic properties, a model not well suited to any additive process. The diversity of additive processes, potential base materials, desired bulk properties, topologies such as lattices, TPMSs, and foams, as well as all the nuances of different processes create myriad possibilities that can’t be reigned in with traditional CAD tools. The only way to get in control of these processes will be for manufacturing engineers to lock down specific workflows and roll those out to their organizations. We are seeing these challenges first hand from our customers, for whom we’ve built a new computational platform for such applications. Undoubtedly, last year proved that AM solutions are becoming more and more popular as a basic production tool. For example, we had a chance to implement a few metal production systems for the new generation medical implants and revolutionizing dental laboratories. There were also important upgrades of the smaller and medium scale production of plastic parts. A good example is the Figure 4 solution from 3D Systems, which combines fast digital manufacturing and postprocessing at the same time. Currently, there is a trend in the market to focus on complexity of the solutions. A good example is the Metal FAB from Additive Industries which can automatically go through each of the production stage starting from 3D printing through depowdering, heat treatment and machining. All of that combined in one machine. 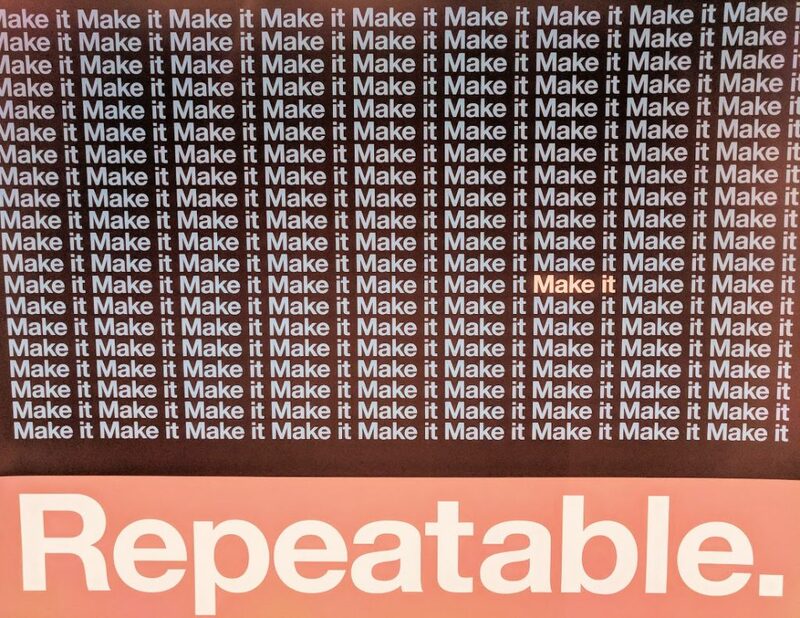 In 2019 we anticipate continued developments across the spectrum of software, hardware and materials, with an emphasis on making AM production-ready. A key part of this will be finding ways to automate routine processes, from workflow management to post production – areas where software will play an integral role. We’re eager for all of the new metal and powder 3D printers to finally come to market and continue driving the cost of industrial-scale 3D printing down. Desktop printers across the board continue to improve and eat away at the market share of high-end expensive machines for run-of-the-mill prototyping needs. Design and engineering students who have had access to 3D printers since they started college are entering the workforce and we’re excited to see what innovations they bring into the workforce. We think that hardware design and innovation cycles are going to speed up even more this year, and you’ll start to see more consumer products with 3D printed components out in the world. In 2019, the industry will continue the swift movement into mass manufacturing on a global scale. The industry will start to see injection molding as the printing press of manufacturing and look to digital-first solutions. As more companies start to understand the true value of Carbon Digital Light Synthesis™ as a mass manufacturing solution, we’ll continue to see exponential growth with industries like aerospace/defense coming into the fold while others, like automotive, healthcare, and consumer goods, continue expanding their use of the technology. With that growth will come a wide range of new materials to address new types of applications. At Carbon, we work closely with each of our customers and partners to understand their individual needs, and develop new materials that can be used to produce durable, functional, end-use parts. In 2018, we developed several new materials to push further into industries like healthcare, consumer goods, and automotive, and we’ll continue to develop more innovative materials in 2019. As we do that, we will be thoughtful in how we develop them, and our hope is that the industry will work together to establish standards and coordination when it comes to sustainability for digital manufacturing. We want to ensure we’re creating a sustainable future, and we’re in a very unique position to do that. There is a huge opportunity here for us to create something that can have a lasting impact, and Carbon is committed to doing that in 2019 and beyond. In total, these advances in capability will enable the traditional 3DP/AM industry to go from a modest $10B industry to a multi-hundred billion digital manufacturing juggernaut! Christoph Schell, president of 3D printing and digital manufacturing, HP Inc.
Hope is not a strategy! Our plans for 2019 expect that we will see accelerated impact of digital manufacturing take hold in the form of production applications, particularly across the automotive, industrial and medical sectors. Digital manufacturing at scale requires the repeatability and quality of parts to rival that of injection molding. We will continue to push our tolerances and process capabilities to not only exceed those in the 3D category, but manufacturing as a whole. 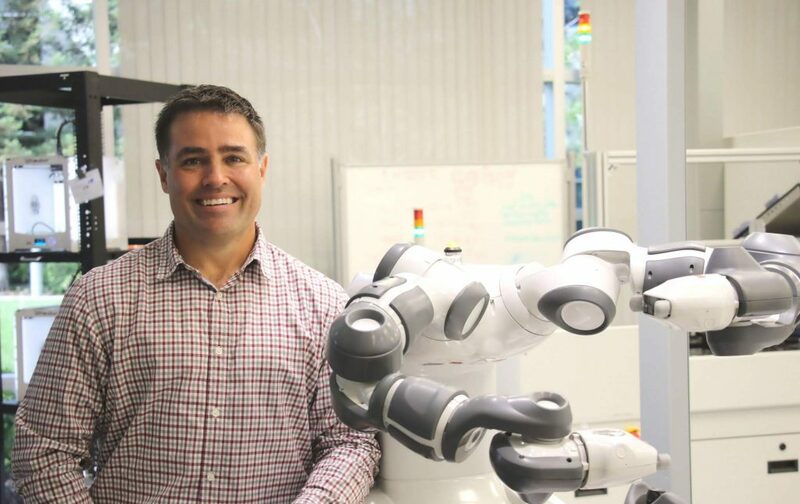 New materials will drive new applications, and I expect we’ll see designers and engineers continue to explore the advantages of voxel-level capabilities to incorporate connected devices, sensors, and variable properties into new applications. I believe in the year ahead customers will continue to push the limits of performance and productivity of HP solutions, both in plastics and metals. The trend I see in 3D printing is the merging of 3D printing with IoT. While 3D Printing is moving from prototypes to first volume productions (e.g. BMW has the first 3D printed parts in their cars) there is a need to move also the equipment and full production chain from manual operations to fully automatic operation. Since this is a green field approach there is the chance to use the latest IoT standards to connect the printers and post-processing equipment with an automation and workflow layer. This will enable an almost full digital production chain which is not possible with established manufacturing processes due to the installed older equipment. Execution will be paramount in 2019. Many 3D printing companies are bubbling with innovation, but some of those companies will not make it; that is the nature of any industry. The companies that execute well will succeed. This means machines and technology that deliver on promises, management teams geared toward solving customer problems and technology that is easy to use for both non-expert and expert users. In addition, the recent trend towards building trust into functional 3D printed parts with secure marking, such as QR codes, will intensify. 3D printing is a digital technology, not just a physical technology, combining the virtual and real. Users will look to 3D print more digital information into parts for authenticity, traceability and compliance and then extract that information on demand. This will become a big area of focus as people try to solve problems in the areas of service, production and engineering. Most innovation in 2019 will be driven by hybridization, not just the core 3D printing technologies. This trend in additive manufacturing began to emerge in 2018. We will see more 3D printers become hybrid technologies with the ability to combine different materials in the 3D printer to create new digital materials for a specific purpose, such as electrically conductive properties, and much more. For sure there will be other developments, aiming at increasing the range of materials, that are available for AM, in particular composite materials. There will be more interest in the Healthcare sector (more than 21% of CAGR 2018-2024) and the customized production will represent the stimulus of the future technologies. All the market is focused on developing new solutions to speed up the processes and cut the costs. In this scenario, in my opinion, 2019 will be the year of collaboration, where more companies specialized in 3D printing and pre-post processing, will concentrate their know-how to offer a complete solution for the end user. Like traditional manufacturing, it is not always possible to have a perfect part with the required finishing. This led the user to look for very expensive finishing procedures. I think that with this industrial automation goal, there will be a great potentiality for 2019. By all accounts, 2019 should see a continuation of the 2018 trend towards a slower, maturing industry. I’m excited to see the first diode array machines hit the market (Seurat should be in a position to send out test parts, I would hope). But beyond that, the most high profile way that this maturation will crystalize is consolidation: I’ve been told that there are over 160 metal startups alone. That number, if true, is untenable. We will likely see some fragmentation of the market to accommodate new technologies that, in some way or another, are more appropriate to other, previously under-served industries with innovations in speed, print volume, materials and more. Other startups will flounder and fail to raise the necessary capital. Software, too, will see consolidation. We’ve all heard the common refrain that there are too many steps involved in making an additive part reality. The consumer is screaming for integrated solutions, and the reality is that it’s difficult for engineers to keep on learning new interfaces and enterprises to accept new companies: Boeing has a long-term contract with Dassault, for instance. In short: Startups are at a disadvantage and the additive software market is still small. Expect to see consolidation in 2019. Scale: We’ve been talking about this for a while, but we saw our first customers break through 1.25m polymer parts/year, while our metal friends are producing fewer parts but often more revenue. These are companies driven by relatively few, solid use cases. Given the other use cases that we’ve seen in the pipeline, I expect to see companies easily cross the 3m parts/year threshold in 2019. The stars of this industry are just quietly pushing along, giving the industry real, industrial momentum. 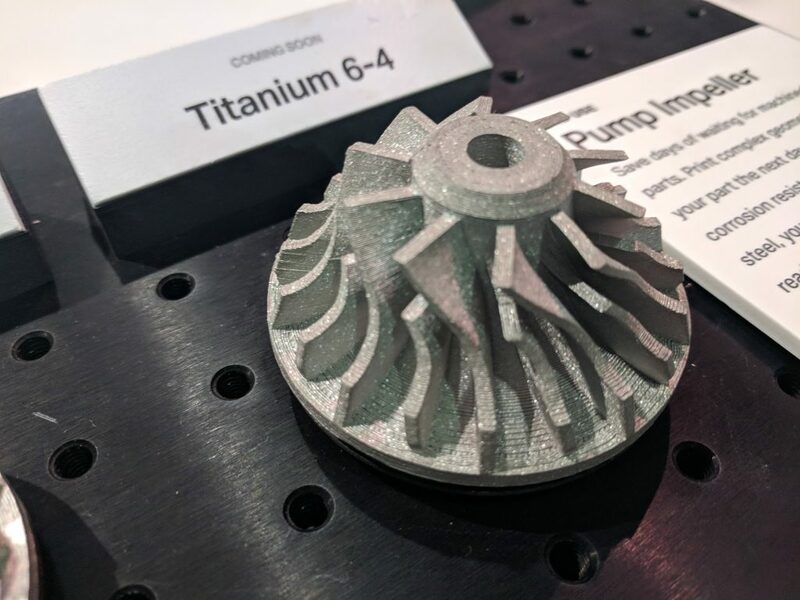 For 2019, we expect new users will continue to find their way towards additive manufacturing, and we’ll see an increasing number of companies shifting their production to AM or adding AM into the mix. New product introductions will bring success and failure, and both are key for this steady growth, with the learning opportunities that they present. We don’t expect 2019 to become an inflection point in the history of AM, but the stage is set for another year of incremental steps towards an additive future. The slow revolution continues.